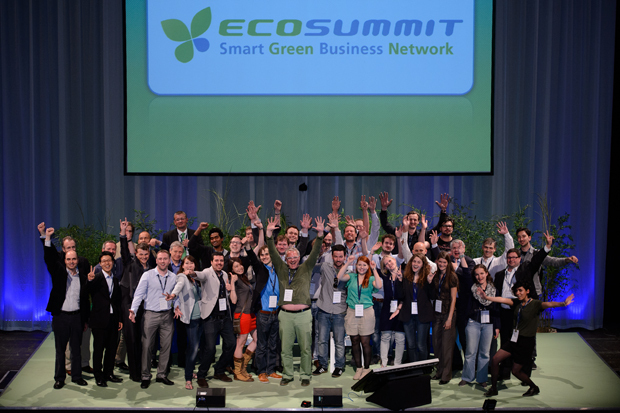 Our 5th conference Ecosummit Berlin 2013 was celebrated on 4-5 June 2013 at the magic Radialsystem and was supported by 20 sponsors that are profiled below. We are very grateful for their support and cooperation. Gimv is a European investment company with over three decades experience in private equity and venture capital. Gimv is listed on NYSE Euronext Brussels. Gimv currently manages around €1.8 billion (including third party funds) of investments in 85 portfolio companies, which jointly realise a turnover of more than €6 billion and employ over 28.000 professionals. As a recognized market leader in selected investment platforms, Gimv identifies entrepreneurial and innovative companies with high-growth potential and supports them in their transformation into market leaders. Gimv’s four investment platforms are: Consumer 2020, Health & Care, Smart Industries and Sustainable Cities. Each of these platforms works with a skilled and dedicated team across Gimv’s home markets of the Benelux, France and Germany and can count on an extended international network of experts. The unique Autodesk Clean Tech Partner Program supports the efforts, innovations, and environmental advancements of clean technology pioneers, by providing world-class software to design, visualize, and simulate their groundbreaking ideas through the creation of digital models and prototypes. The program offers participants software licenses valued at up to €120.000 for just €50. With digital prototypes, clean tech innovators can explore and communicate ideas, test multiple concepts, and accelerate improvements, while supporting the reduction of potentially costly errors. Used by millions of engineers, architects, and design professionals worldwide, Autodesk software helps empower Clean Tech Partners to create a better, more sustainable world. For more information visit www.autodesk.co.uk/cleantech or www.autodesk.de/cleantech. The EDF Group, one of the leaders in the European energy market, is an integrated energy company active in all areas of the business: generation, transmission, distribution, energy supply and trading. The Group is the leading electricity producer in Europe. In France, it has mainly nuclear and hydraulic production facilities where 95% of the electricity output is CO2-free. EDF’s transmission and distribution subsidiaries in France operate 1.285.000 km of low and medium voltage overhead and underground electricity lines and around 100.000 km of high and very high voltage networks. The Group is involved in supplying energy and services to approximately 28 million customers in France. The Group generated consolidated sales of €65.2 billion in 2010, of which 44.5% was achieved outside of France. EDF is listed on the Paris Stock Exchange and is a member of the CAC 40 index. The European Investment Fund‘s central mission is to support Europe’s micro, small and medium-sized businesses (SMEs) by helping them to access finance. EIF designs and develops venture capital, guarantees and microfinance instruments which specifically target this market segment. In this role, EIF fosters EU objectives in support of innovation, research and development, entrepreneurship, growth and employment. EIF’s total net commitments to private equity funds amounted to over €6.9B at end 2012. With investments in over 400 funds, EIF is a leading player in European venture due to the scale and the scope of its investments, especially in high-tech and early stage segments. EIF’s guarantees loan portfolio totaled over €4.7B in close to 255 operations at end 2012, positioning it as a major European SME guarantees actor and a leading micro-finance guarantor. Germany Trade & Invest is the economic development agency of the Federal Republic of Germany. The company helps create and secure extra employment opportunities, strengthening Germany as a business location. With more than 50 offices in Germany and abroad and its network of partners throughout the world, Germany Trade & Invest supports German companies setting up in foreign markets, promotes Germany as a business location and assists foreign companies setting up in Germany. NRW.BANK Equity Investments, the investment arm of the state development bank of North Rhine-Westphalia, is an investment unit specializing in direct and fund of fund investments. Within direct investments, it is focused on small and medium sized companies. The unit prefers to invest in seed, startup, early, mid and later stage ventures, buy-outs and spin-offs. It seeks to provide private equity and venture capital financing to enterprises that focus on established industry sectors and companies active in IT, software and media technologies as well as in life sciences and cleantech. NRW.BANK Equity Investments is based in Duesseldorf, Germany. Chrysalix SET is the Amsterdam-based venture capitalist firm managing SET Fund I and SET Fund II with investments in early and growth stage European technology companies with high growth potential that also have an impact on the future of energy in this world. We care about sustainability issues and want to contribute in a meaningful way, while maximizing returns for our investors by creating valuable companies. Typically these companies are active in the markets for sustainable energy generation, smart grid, transmission, storage and energy efficiency. The experienced Chrysalix SET investment team and partners have shown that their value chain investment philosophy and company building capabilities provide more than just financing. We have a long standing venture capital track record in various industries, since 2007 exclusively focused on sustainable energy technologies. The whole team comes from the industry and is geared towards the interests of its limited partners and the portfolio companies it has invested in. Chrysalix SET is a founding member of The Chrysalix Global Network (GCN), a premier alliance of independent, top-tier venture capital firms including Vancouver-based Chrysalix EVC and Beijing-based GRC Chrysalix. Chrysalix SET’s current portfolio includes, among others, AlertMe, General Fusion, MicroShade, NGentec, EnOcean and Sefaira. Smart Green Startup: ubitricity was founded in Berlin in 2008 to develop new services for households with electric vehicles. We are now one of the few independent energy providers in Germany who deliver renewable electricity to households. In the future, ubitricity will offer its customers who drive EVs the possibility to charge up everywhere (e.g. at work) in total security and confidence, and with one single, simple bill to pay. Customers will receive the benefits of a new infrastructure concept – delivery, metering and billing services for green electricity. In 2010, ubitricity was able to win Earlybird, one of Europe’s most successful venture capital investors, for a Series A financing round. ubitricity’s Mobile Metering concept makes a comprehensive charging infrastructure for electric vehicles (EV) affordable. The metering and communications technology necessary for recharging a vehicle is mobilized. It is installed in the EV or inside the charging cable rather than inside every single charging point. As a result, charging points can be reduced to lean and affordable ubitricity system sockets that can easily be installed anywhere users need them, and allow for truly unlimited mobility. Ecomobilité Ventures, Europe’s first private equity fund dedicated to innovation in sustainable mobility, was created by French national railway operator SNCF, mobile telephone operator Orange and energy company Total. Ecomobilité Ventures recently invested a total of €5 million to acquire equity interests in three European ecomobility startups: Move About, EZ‐Wheel and Ouicar. The key to ensuring the success of sustainable mobility lies in stepped up innovation and more extensive cooperation between startups and large corporations. Ecomobilité Ventures intends to provide long‐term support for this fast growing industry. Backed by €25 million in capital, the corporate partnership is focusing its investments on four priority areas: transportation services, innovative information technology, connected vehicles and mobility products, and intelligent infrastructure. The three fledgling companies selected contribute to fostering the emergence of new modes of transportation and mobility solutions, each in its own sector. Smart Green Startup: GreenPocket provides pioneering software for smart metering and smart home. Combining the best of the Internet with the new world of smart energy, we enable utilities to significantly increase the energy efficiency of private households, businesses and municipalities. Founded in 2009, GreenPocket has quickly become a European player in the Smart Energy market. Next to several major European utilities, we have already signed up 30 renowned German utilities, such as Vattenfall Germany and the municipal utilities in Munich, Frankfurt, Berlin, Cologne, Bremen and Bonn. Since the company’s foundation, we have launched over 50 energy application projects. Today, we are proud to say that we are Germany’s leading software provider for consumer-oriented smart metering and smart home software. Osborne Clarke as every law firm has legal expertise at its heart. What makes a difference is how that expertise is applied. Osborne Clarke’s clients benefit from the way the firm combines its top-class legal expertise with an international perspective and in-depth sector knowledge to provide focused, relevant and practical advice to clients in a number of businesses sectors. The firm’s lawyers are dedicated to helping clients achieve their business objectives. From the UK’s first wind farm to the largest European energy projects, the team has years of in-depth experience in the energy sector. Clients include utilities, funders, developers, suppliers and cleantech and renewable energy companies. Our development programme results in lawyers who really understand the sectors in which their clients operate and encourages the development of bespoke sector-focused products and services. VNT is a Finnish-German venture capital management company with three funds and €157M assets under management. VNT is operating in Europe and focusing on clean technologies. More specifically, the investment focus is on renewable and distributed power generation and energy efficiency technologies, especially in power electronic applications. Of particular interest are innovations in wind, solar, wave power and biomass – as well as energy efficiency solutions as electrical drive trains to industry, heavy mobile work machines and solid-state lighting. A wide industrial business experience, an active management and fair play are the characteristics of VNT. The VNT team assists in all business aspects, in particular in optimizing business models, marketing, operations and management tasks, establishing supply chains and sales networks. Transmission and Substation solutions that reduce service disruptions for consumers and lower operating expenses for utilities. Grid Security solutions that address physical and cyber security compliance needs for critical infrastructure. Building Energy Management solutions that enable facility operators to monitor, report, and control energy use. Enterprise and Grid Operation solutions that enable scalable and secure data collection and storage solutions for analytics and management systems. Allocate is an international consulting company with a strong focus on Top Management Consulting and Executive Search. We maximize your return on allocation by merging smart strategies with integrated resource allocation. During our consulting projects we build one team with the client in which our senior experts are supported by best-in-class partners. Our unique strategy-driven management philosophy encompasses the 4 essential resource allocation and optimization challenges that are the fundamental corporate value levers: allocation and management of capital resources, capacity resources, human resources and energy and material resources. Smart Green Startup: Govecs is involved in the development, production and marketing of electric vehicles. The headquarter of Govecs is in Munich. Govecs was founded in 2009 with the aim of supplying clean, efficient, reliable and affordable vehicles for road use. Top designers and the best engineers work to create electric vehicles that are not only stylish, but also meet the requirements of modern electric mobility. All its electric scooters are manufactured at the company’s own certified production plant in Breslau. In 2011, Govecs won the E-Scooter of the Year Award with its GO! S2.4 model and the eCarTec Award with the GO! S3.4, the company’s first electric scooter in the motorcycle category. In 2012, Govecs won the E-Scooter of the Year Award in two categories and once again won the eCarTec Award for the GO! S1.4, the first Govecs scooter with an exchangeable battery. Govecs scooters are made in Europe for Europe, born in Bavaria. ECN’s groundbreaking renewable energy technologies and knowledge offer businesses economic opportunities and innovative distinctiveness. Furthermore, clean tech investors are able to benefit from our high-level technology due diligence, which is based on our extensive knowledge of the perspectives and quality of technologies. ECN plays a leading role in energy R&D and policy advice and has gained a strong reputation worldwide in the fields of solar and wind energy, bio-energy, energy efficiency, environmental research and policy studies. Countries and their economies develop and grow. To meet the future energy needs, the world’s energy system needs to become (more) sustainable. With and for the market, we develop knowledge and technology that enable a transition to a sustainable energy system. Our track record of success is illustrated by the fact that over 60% of all solar modules in the world contain ECN technology and 80% of Europe’s offshore wind farms is realised with R&D and support from ECN. Dentons is a new global law firm, combined of international law firm Salans LLP, Canadian law firm Fraser Milner Casgrain LLP (FMC) and international law firm SNR Denton. We are among the top 10 global law firms measured by the number of lawyers and have offices from the US to China with a strong network of associated law firms in Africa. We are where you are – or where you want to go! Our clients benefit from an exceptional global practice in the venture capital and the Cleantech and energy sectors. We have a deep understanding and knowledge of the energy industry, we see opportunities within traditional sectors and especially within new technologies, and we can help shape the business you want — irrespective of whether you are a startup, an SME or a big corporate. Through our extensive global relationships with venture capital investors and other financial investors, we also help promising companies in the Cleantech and energy sectors gain access to needed capital. We advise not only on a company’s current financing needs but also on other value-impacting issues, such as intellectual property protection, employee incentive schemes, business strategies, mergers and acquisitions, re-financings and exits, including trade sales and IPOs. Founded in 2006 and headquartered in Munich, the climate protection consultancy has associated companies in the USA, Japan, Austria, Greece and Armenia. ClimatePartner delivers individual climate protection solutions for more than 1,000 customers from all over the world, mainly consisting of large and medium-sized companies. This climate protection consultancy is certified by the technical inspection authority (TÜV) as a provider of IT system solutions for carbon calculation and offsetting. ClimatePartner works closely with environmental organizations and is a member in various international committees. amiando offers the easiest way to organize your event. More than 70.000 events worldwide use amiando to sell tickets online and to create professional registration forms for events. Thus your event registration becomes easier for your participants and you save costs and work at the same time when organizing your event.